In the 1960s the Nashua River was starved of oxygen, biologically dead, and one of the ten most polluted rivers in the United States. The sludge-filled river, which flows through New Hampshire and Massachusetts, was a different color every day, depending on what was discharged that day. People could smell its stench from a mile away. In 1962, Marion Stoddart moved to the area with her family. Stoddart made it her life mission to restore the river to its pre-industrial condition--running clean and clear, teeming with fish and wildlife. She mobilized industry leaders, government officials, and concerned citizens and ultimately accomplished her goal. At that time in the United States, it was legal to dump sewage and industrial waste into rivers. One of Stoddart's initial tasks was to push hard for federal and state legislation. 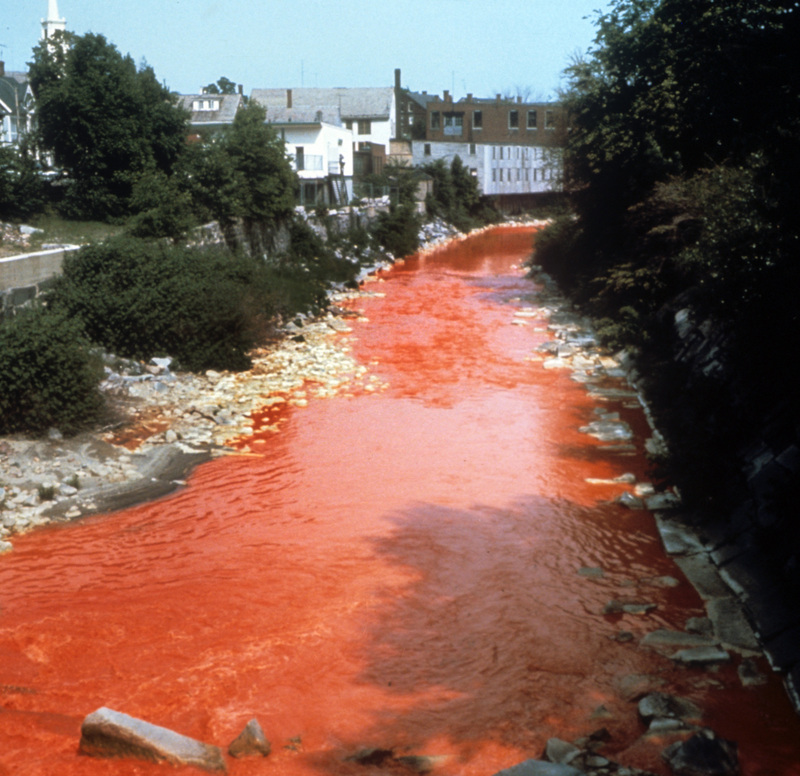 The federal Water Quality Act in 1965 and the Massachusetts Clean Water Act of 1966 made the cleanup of the river possible and set the stage for other states to follow suit. She then persuaded municipalities to appropriate their share of funds for wastewater treatment. Wastewater treatment plants were constructed and put into service in the 1970s. 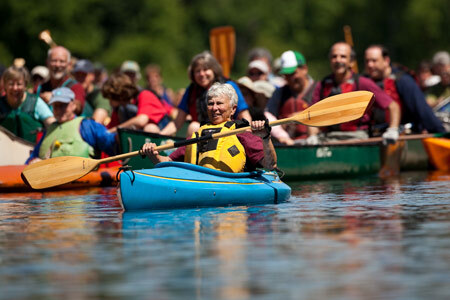 In 1969, Stoddart founded the Nashua River Watershed Association (NRWA) to protect the river and educate adults and children. A key objective was to permanently protect the land adjacent to the river--continuous "greenways" extending at least 300 feet back from the river and major tributaries. These buffer zones protect the river from storm water runoff--which often contains lawn care and agricultural chemicals, petroleum from vehicles, and other contaminants. Greenways also provide wildlife habitat and corridors, protect the floodplain and wetlands, and enable people to enjoy the river. With its goal nearly half completed, and approximately 200 miles of shoreline currently protected, continuing efforts are seeded via contributions to the Marion Stoddart Greenway Fund, which was created last year on her 85th birthday. Animals--including fish, turtles, mink, otters, ospreys, and bald eagles--returned to the river. People flock there to fish, boat, hike, and bicycle. The clean river boosted the economy of cities along its route, increasing property values and attracting new businesses. Ordinary citizens learned that they have the power to create change. Today, segments of the river are candidates for "Wild and Scenic" designation. The designation would provide federal funds to preserve the river and bordering land in their natural state due to outstanding scenic, recreational, ecological, and historical values (see before and after photos). In 1987 Stoddart received a United Nations Environment Programme Global 500 Award. She was profiled by National Geographic in 1993 and in Lynne Cherry's best-selling children's book, A River Ran Wild. In 2009 the National Women's History Project honored her as a "Woman Taking the Lead to Save Our Planet." In 2010, Susan Edwards released the 30-minute film Marion Stoddart: The Work of 1000, which documents Stoddart's life, and an accompanying leadership handbook. Longing for a Larger Purpose--Shortly after moving to Groton in 1962, Stoddart asked herself, "Why am I here?" She wanted to do more than simply make her family happy. Inspiration--Stoddart was inspired by a radio program that asserted that with vision and commitment, one person can do the work of 1000 people. Through her work in the League of Women Voters, she knew the successful environmental advocate, Allen Morgan, and admired his commitment, drive, and collaborative approach. Rachel Carson's 1962 masterpiece, Silent Spring, further ignited her. Vision--One day, standing in her back yard looking out over the fields and woods toward the reeking Nashua River a mile away, Stoddart created a vivid picture in her mind of the river and adjacent land restored to its original beauty, abundant with wildlife and attracting people as in times past. The vision came easily, never left her mind--and eventually became reality. Commitment--Stoddart thought to herself, "I will never know what it is I am supposed to be doing, but I will take on the greatest challenge I believe I can accomplish in my lifetime, and commit to that." She made a lifetime commitment to herself to restore the river--certain that she would find a way--without initially discussing the idea with anyone or knowing how she was going to do it. Homework--She informed herself on the issues, players, politics, existing laws, and process for creating new laws. Having earned a B.A. in anthropology and sociology, and claiming to be of only average intelligence, she studied ways to change the laws to stop the polluting. Says Stoddart, "You don't have to be super-smart or super-anything, only committed." Collaboration--Stoddart's work required thousands of helpers. In the 1960s, Stoddart contacted the leaders of every local industry; service, social, fraternal, recreational, and conservation organizations; and city and town mayors and boards of selectmen, planning boards, conservation commissions, boards of health, and recreation commissions. She met with state and local leaders, stakeholders, and citizens, becoming their friends, and listening, educating, and successfully enlisting them in her vision. When the NRWA was formed, the largest paper company joined. Its chief executive, Don Crocker, sent a letter to the executives of other local industries to convince them that they all would benefit from clean water. He told Stoddart, "I'm tired of wearing a black hat. I want to wear a white hat." Crocker and Fitchburg Mayor Bill Flynn joined NRWA's board of directors. Stoddart's team amassed 6,287 citizen signatures protesting the condition of the river and presented them to Massachusetts Governor John Volpe, along with a bottle of the revolting river water--with mayors and selectmen from all the riverside cities and towns, as well as legislators, photographers, and reporters, in attendance. The bowled-over governor vowed to keep the bottle of water on his desk as a reminder of what needed to be done. Asking for What You Want--Many thought Stoddart's goal of a clean Nashua River not only preposterous but threatening to the local economy as well. One riverside industry asked its employees, "Which would you rather have--clean water or your jobs?" (This false choice was later dispelled.) Stoddart received death threats. In 1966, U.S. Senator Ted Kennedy toured polluted rivers in the northeast with Secretary of the Interior Stewart Udall. At the airport, Stoddart and her entourage of hundreds of citizens greeted Kennedy and Udall with a bottle of putrid Nashua River water. State officials, including the governor, also attended. As she prepared notes for a brief speech, Stoddart listed ways in which the public desired to use the Nashua River. She wrote "fishing, boating, irrigation, swimming." Then she crossed off "swimming," thinking the idea would strain credibility, given the horrific state of the river and because making the water clean enough for swimming would greatly escalate wastewater treatment costs. As she was pondering whether to add "swimming" back in, Lieutenant Governor Elliot Richardson leaned over and whispered in her ear, "Ask for swimming. If you don't, you'll never get it." So Stoddart asked for swimming. On returning to Boston that same day, Governor Volpe signed into law the Massachusetts Clean Water Act. Surrounding Yourself with Positive-Thinking People--She avoids spending time with negative-thinking people, noting "you'll never change their minds and they'll only pull you down." When you work with positive-thinking people, she says things move quickly and become synergistic and fun, magnetizing more positive-thinking people to the effort. Seeing Challenges as Opportunities--Stoddart treats obstacles as exciting challenges. When blocked, she simply looks for another way--devoid of anger, frustration, or discouragement. Involving the Media. Doing so creates pressure for change and informs citizens that their voices are being heard, supported, and acted on. Welcoming Help--Stoddart says support sometimes arrives unexpectedly. In 1968, she received a call from Commanding Officer Jack Cushman of Fort Devens, a nearby military installation. Eight miles of the river flow through the army base. Cushman offered to help. Stoddart met with him and he gave her everything she asked for, plus more--a two-story building including heat, lights, and a telephone, as well as the services of engineers, draftspeople, and other staff with specialized training. Fort Devens designated the land beside the river as greenway. The army provided approximately 13 Green Berets with dump trucks to transport and supervise approximately 400 high-school dropouts sponsored by the U.S. Department of Labor to clean up riverbanks and build trails along the river. Persistence--Mayor Flynn remarked that in the 1960s, activists visited polluted rivers to protest and make headlines, and then they left. Stoddart was different--she was "in it for the long haul" with her relentless, collaborative approach. Knowing the Work Will Never Be Completed--Today, Stoddart continues advocating for greenways and ensuring that laws are implemented and kept strong to prevent backsliding. Stoddart's approach is not necessarily the remedy for every problematic situation. Yet she provides a powerful example to us all. Through collaboration, passion, and persistence, Stoddart overcame seemingly impossible obstacles to manifest her vision. Ellen Moyer, Ph.D., P.E., is principal of Greenvironment, LLC, a consulting firm dedicated to remediating environmental problems and promoting green practices to prevent new problems. You can connect with her on LinkedIn and Facebook or find more information on her website.